The 17mo toddler was restless - she had been cooped up in the house for most of the day and because the house is just a 900sqf box, she couldn't run as much as she wants. Yeay! The field is bigger than my house! This semester break? I made it up, and score countless brownie points in Khayla's book. We brought her to the Aquaria a couple of weeks ago, then last week we brought her to play at the indoor play area at Paradigm Mall and watch her first movie (Ice Age 4, and 10 minutes later she dozed off because the cinema was dark and cold). How little Khayla must have enjoyed her weekends because she always wakes up earlier than usual. So back to Lake Garden story. We were fortunate to find a parking space to park our not so compact car anymore. 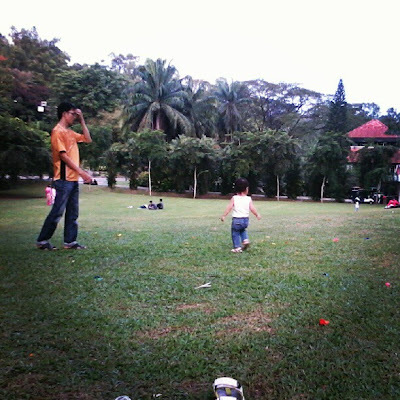 The moment Khayla got off the car, she was already heading towards the playground and pointing at the swings! Oooh... how she loves the baby swing! We also took her to play the baby slides, and she was an expert at pushing herself down the slide, then scrambling up to climb the slide again. Tired of the playground, we wandered off to the park and the baby-Daddy team started to run down the jogging track while I pushed the stroller. This girl puzzled me. She ate maybe 2 spoonfuls of rice, which she ate one grain at a time but heck, the way she sprinted off like an Energizer bunny, where did that extra energy came from??? I think we must have walked for a half a kilometer, before both Daddy and baby plonked themselves on the curb for a short while - then she spotted the fountain. Shrieking excitedly, she was up and running towards the fountain! Another baby copied her action - wow, babies must have love fountains. We reached an open field, and since the day was nice and not too hot, we decided to bring along a mat which we spread on the ground under a tree. Then I went off to buy some ice creams, snacks and a drink for both of us while Khayla was already sipping on her Dutch Lady chocolate drink. It was a joy sitting there having our tea while watching other families playing soccer, badminton and frisbee. After a while, Khayla decided to explore the field and the two love of my life went to explore the bridge across the field. But eventually she did burst the balloon and then the picnic was over. I am looking forward to plan the next weekend. Btw, Khayla added more to her nonsense vocab this week - and she was endlessly babbling in her own language. It goes like this - AMIAMIAMICHIWOWO!CHIWOWO!AMIAMIIIIII! So Internet, AMIAMIAMI! (I sure hope she doesn't mean she wants to go to Miami).